If you are planning your holidays to Lanzarote, the following information may help by giving you an overview on the island. 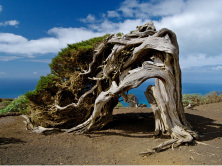 Known as the Isla del Fuego [Fire Island], above all, Lanzarote is about visual impact – being batten and untamed. In the 18th century, Timanfaya, the liveliest of the island’s 300 volcanoes, erupted 26 times in six years, oozing treacly lava over most of the south, and leaving charcoal peaks and red craters. However, any idea that a little island devastated by volcanic explosions and blanketed with lava might not have much to see could hardly be more wrong. Lanzarote holidays have so much to interest and amaze the visitor that every outing seems to be interrupted by constant pauses and photo stops. Some sights are the product of the power of nature alone, some are man-made, and some an intriguing combination of the two. It’s fascinating to see how man’s inventiveness has turned the volcanic activity to advantage, especially the covering of acres of good soil with picón, black volcanic grit that absorbs any dew or precipitation and helps crops flourish. Had it not been for one native creative artist, César Manrique, Lanzarote might have been completely buried under “all-inclusives”. For two decades, he spearheaded a campaign that lead to the banning of billboards and high-rises, turning natural attributes into futuristic-looking visitor attractions and dotting his sculptures everywhere. In the north, the lava gives way to scrubby, scarlet scenery, windswept surfing beaches and sudden bursts of colour provided by bright birds of paradise and swathes of palms and fir trees. If you are planning on some beach time during your Lanzarote holiday you will not be disappointed. The island has a large variety of wonderful beaches. From the beautiful white sands of the north to the golden sands of Puerto del Carmen to the black sand at Playa Quemada, one will be amazed by this contrast that is unique to Lanzarote. The main beach in Puerto del Carmen is known as Playa Grande. This is a long beach facing the busy resort. 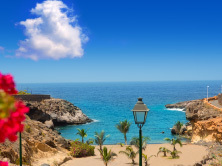 There are numerous beaches in the area running from Arrecife airport, Guacimeta, right through to the old town of Puerto del Carmen. Adjacent to the old town lies a beautiful picturesque beach, Playa Chica. This beach is host to a wide variety of sporting activities and an ideal location for those who want a more active Lanzarote holiday. Here one can take diving lessons, rent jet skis, go parasailing or do a touch of snorkelling. In the south of Lanzarote near the resort of Playa Blanca lies the most beautiful beach of all, Papagayo. This fantastic white beach is a must for beach lovers and although nudist bathing is common it is by no means compulsory. For those who love surfing and body boarding the beaches of Famara and La Santa, in the west, both present fabulous opportunities. Famara is world famous for its surf but would not be recommended to the fainthearted. In the north of the Lanzarote, near Orzola , there are a number of white sandy beaches. The sand is blown over from the Sahara desert. 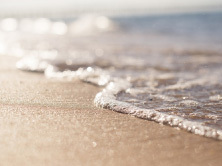 The beaches are isolated but can be accessed by foot and are ideal for anyone who wants a quieter beach experience on their holidays to Lanzarote. In the northeast lies the resort of Costa Teguise. The main beach here is known as Las Cucharas and is famous amongst the windsurfing community. Finally, Arrecife, Lanzarote’s capital, has a wonderful golden beach, El Reducto. 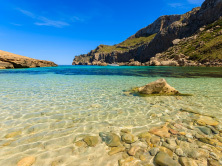 This beach faces a number of Canarian bars where one can have traditional coffee, Cortado, or a relaxing cocktail. 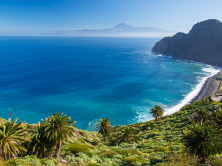 Although all of the Canary Islands have pleasant winter weather, it is Lanzarote that has the most consistent climate. As it is located close to Africa with no high mountains, Lanzarote has more sunshine than any of the other islands. Daytime temperatures in January and February rarely fall below 22°C and rainfall is light and falls on no more than 16 days each year. It is unsurpring that Lanzarote has become a popular winter destination. 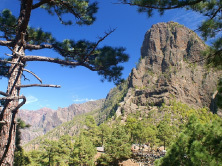 Water is a scarce resource in all the Canary Islands [although less so on Tenerife, Gran Canaria and La Palma] with the situation being severe in Lanzarote which has no more than 6 inches of rain a year and has no permanent water-courses or storage reservoirs. Water was once brought from Gran Canaria in tankers, but now the water supply comes from desalination plants. The hotels in Lanzarote and apartments serving the tourist industry have first call on the water, and many inland villages only have piped water on 2 days a week. Most houses have a roof tank to store the water for the waterless days. On your holidays to Lanzarote you can enjoy restaurants for all tastes: Mexicans, Italians, Chinese, Indians, etc. and, above all, local cuisine. Typical dishes from the Canary Islands is most likely to be found in the capital – Arrecife – and include wrinkled potatoes with mojo, cheese, los pejines, mussels, limpets, burgaos, steamed or in vinegar. Jareadas, fish consommé, Canarian stew are some of the tastiest dishes that you can try when you visit the island. The dishes are mild and are made with local ingredients, like fish seasoned with mojo. If you wish to sample true Canarian food whilst on your holiday in Lanzarote, then the unusual meals times must be appreciated. Breakfast is generally light and rarely served before 09:30. It usually comprises coffee, a sandwich or a small cake. Lunch is usually eaten after 14:30 and may have been preceded by tapas. Lunch is the main meal of the day and dinner is a lighter meal, which is usually eater after 22:00. 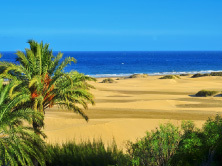 There are 2 fares that you should try on your Lanzarote holiday. One if gofio [ground and toasted wheat or maize], the island’s traditional staple food which dates back to Guanche times. The second is papas arrugadas, small new potatoes with wrinkly skins which are boiled in very salty water and served with most main courses. Main meals in the restaurants in Lanzarote are usually started with a salad or a soup. Particular favourites are fish or vegetable soup. Most restaurants also offer the popular mainland cold soup – gazpacho – which consists of finely chopped onions, tomatoes and garlic. The main course usually includes meat or fish with the most commonly offered meats are beef, chicken, lamb, pork and rabbit. The wild rabbits are hunted on Lanzarote or reared domestically for the table. The meat may be grilled, roasted or it may be prepared in a stew. A wonderful variety of fish and shellfish are also found on menus with the fish usually prepared simply, being fried or grilled. At some of the better fish restaurants, it is possible to select your own fish from a tank or a display refrigerator. Usually the most common fish available are sea bass, hake, swordfish, sole, tuna and parrotfish. Some excellent shellfish is also available including prawns, mussels and squid. Particular Canarian specialities are the sauces that are provided with the fish and meat dishes. the red mojo rojo s a spicy vinaigrette-type sauce made from a mixture of chilli, cumin, paprika and saffron and usually served with meat. Mojo verde is a green variation prepared with coriander or parsley instead of paprika making a perfect accompaniment to fish. Deserts are usually confined to traditional Spanish favourites such as creme caramel, ice cream or fruit. You may be lucky enough to be offered a traditional local dessert such as frangollas which is a corn-based milk pudding flavoured with cinnamon, honey and brandy. Alternatively you may be offered torrijas which are sweet fritters of maize flour flavoured with honey and aniseed. Any local cheese on offer will be goat’s milk cheese which is produced near Teguise. There are plenty of opportunities for some retail therapy on your Lanzarote holidays. Lanzarote and the rest of the Canary Islands enjoy a special Duty Free Tax status. Cigarettes, Alcohol, Perfumes and Petrol are much cheaper than in Mainland Spain and the rest of the EU. These duty free goods are usually much cheaper in the resorts and towns than in the airport and on-board the airplane. 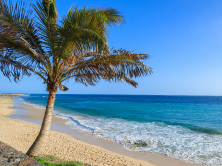 There are numerous boutiques to be found in the main resorts, however the best shopping districts are Calle Real in Arrecife, the Biosfera Shopping Centre in Puerto del Carmen and the Deiland Centre in Playa Honda. In Arrecife the main shopping street is Calle Leon Y Castillo (known locally as Calle Real). The Biosfera Centre in Puerto del Carmen has many clothes shops including Zara. The Deiland Shopping Centre in Playa Honda hosts an array of Shops and relaxing cafes as well as a Cinema. There is a large market in the old capital of Teguise every Sunday morning between 8:30am and 2pm. Here you will find a wide variety of items for sale such as hand-made table-cloths, jewellery, paintings, African wood carvings, local wines and of course the fake watches and handbags!